The debate on privatizing the war in Afghanistan is heating up yet again, with Democratic lawmakers pledging to end so-called “forever wars.” The public is slowly recognizing the war’s hidden costs and global scale. In 2016, 1 in 4 U.S. armed personnel in Iraq and Afghanistan was a private contractor. This means that the war is already being outsourced, yet scholars, the media and the general public know almost nothing about it. Because contractors operate in the shadows, without effective public oversight, they allow policymakers to have their cake and eat it too – by appearing to withdraw, while keeping proxy forces in theater. Who are the contractors who actually execute American policy? Are they equipped to succeed in this important task? What risks is the U.S. asking them to take? The simple truth is that there is little reliable data about this industry. Without this data, scholars cannot ask even the most basic questions of whether using contractors works better than the alternative, namely military personal or local forces – or, indeed, whether it works at all. We are researchers who study the privatization of security and its implications. In our study, published on Dec. 5 in Armed Forces & Society, we shed light on some of the aspects of this largely invisible workforce for the first time. 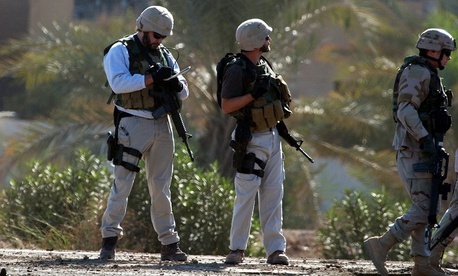 It’s hard to get data about private military contractors, mainly because of the proprietary business secrets. Despite the fact that those companies act as proxies of the state, they are not legally obligated to share information with the public on their actions, organization or labor force. Given how centrally private military companies feature in American foreign policy debates lately, Americans may assume that their policymakers are working from a detailed understanding of the contractor workforce. After all, the point is to weigh the contractors’ merits against uniformed service members, about whom the public have excellent information. But this does not appear to be the case. There isn’t a detailed account of the private military industry’s practices, workforce, misconducts or contracts. Noticing this gap, in 2008, Congress instructed the Department of Defense to start collecting data on private security personnel. However, this data is limited, as security contractors comprise just 10 to 20 percent of DOD contractors in Afghanistan and Iraq. The rest provide mission essential functions, such as engineering, communication and transportation and many others. Those roles take place in conflict areas and place those contractors at similar risk level as the soldiers. Since it is impossible to say anything directly about the total population of American and British contractors who have served in Iraq, we sought out a sample for which records do exist – namely, those who died and whose deaths were recorded in obituaries. They are the corporate war dead. They are not a representative sample, since some occupations and some personalities are more likely to risk death in combat than others, but in a setting without any reliable information they offer us a glimpse to this industry’s workforce. We collected open source data from iCasualties, a site that collects basic data on soldiers and contractors casualties. Using this data we gathered demographic information from obituaries and news articles, on 238 contractors who perished in Iraq between 2006 and 2016. We learned that the contractors in our sample are predominantly white man in their 40s who choose contracting as a second career. Most are veterans with significant military experience. Among those contractors who were previously deployed as service members, many are former officers and about half of them are Special Forces veterans. They are more likely to have a college degree than their active duty counterparts, but less likely than their fellow veterans in the general population. They come from parts of the U.S. or United Kingdom with higher unemployment rates and fewer job opportunities – not the areas with the strongest traditions for military service. What was it like to be a contractor in Iraq? From our sample of the corporate war dead, most of their deployments were short, between a week to a month. Many contractors treated it as a temporary job, taking a few tours. Most of those in our sample worked in security, an especially dangerous job. Indeed, these contractors were more likely to be killed by enemy action than the American service members they worked alongside. Of course, all of the members of our sample died. Contractors faced mortal peril in different places than service members. Many more of them died in Baghdad or on the roads than did at work or on a base. This makes sense, considering that contractors that often lacked a protective umbrella of support from other units. If encountering unexpected threats, their support was less organized and effective. They were also routinely tasked with different types of missions: less combat work, and more logistics, maintenance or security type work. These types of missions – for example, driving the supply trucks to and from a base – are less protected and have routines that can be detected by insurgents. To make informed decisions about whether and how to privatize future military commitments, the public needs at least a general understanding of the people tasked with projecting American force abroad. The corporate war dead of future conflicts will almost certainly include Americans who previously served their country honorably in uniform. Their lives should be viewed as no more expendable as contractors than as soldiers, sailors, airmen or Marines. Our contribution to the ongoing debate on contractors is important, but modest. Our sample represents less than a quarter of the private military contractors’ total population. The public still knows almost nothing about military contractors or the organizations they are affiliated with. Contractors’ variation in experience, training and capabilities is broad and not well understood. Most contractors are not Westerners, but rather third country nationals, recruits from Iraq and Afghanistan. Many others are veterans from other countries, such as Peru, Colombia, Fiji and Uganda. Some bring less institutional experience, as the industry recruits former child soldiers from Sierra Leone and ex-guerrilla fighters from the FARC. Some very big questions still lack any answer at all. Are contractors better or worse than service members in achieving a country’s political ends abroad? Is the U.S. using them effectively, making the most of what they do offer and mitigating those areas where they fall short? What are the unintended consequences of reliance on contractors in terms of human rights, legal complication, mismanagement and accountability? Private military and security companies do not have real incentive to share these data, but the public interest is clear: The public needs it.